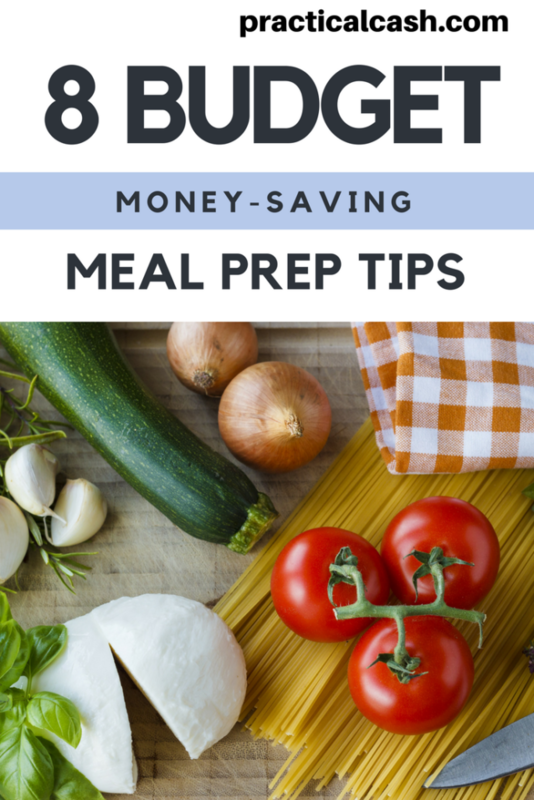 Budget meal prep is an essential way to control your food costs and save money on groceries. Eating out can seriously derail any frugal budget. But if you work a job or care for kids or family members, the last thing you want to do at the end of a busy day is prepare a healthy, nutritious meal. Or at least I often find myself frustrated with meal prep tasks at the end of a busy day! When my husband and I first got married, we were on an enlisted military budget. Well, not really, because we often broke out the credit card and lived above our means with when we didn’t feel like cooking. We learned how to pay off debt and no longer pay for meals out unless we have the cash, but we still do eat out sometimes just because cooking after work feels like a real pain. If I don’t cook and we go out to eat, I know my family of three will be spending at least $80, and often more, at a sit-down restaurant. Do it a couple of times a month and you’re talking about hundreds added to your monthly budget expenses. Even fast food several times a week really adds up. You can really save a lot of money by just doing some simple meal prep recipes. Prepared foods you buy at the store net you less time in the kitchen, but they’re also pricey and are often higher in fat, sodium, and carbs than fresh, homecooked meals. You don’t have the control over the nutrition and ingredients that you do if you cook. If your family is gluten free, dairy free, vegetarian or vegan, or keto, you may find it difficult to find prepared foods that fit your nutritional needs. So healthy meal preps really put you in control of your diet and health. If you don’t want the hassle of grocery shopping, selecting ingredients or recipes, or live in a city where it’s inconvenient, you can skip that step and still save money on eating out. Meal kit delivery services – Green Chef is one of my favorites – deliver fresh ingredients to your door. You can still meal prep in advance so you have ready to eat meals to take to work or eat at home. With Green Chef, ou simply go online and pick the meals you want to have delivered. It’s truly the easiest way to meal prep in advance. You just cook the food with the recipes provided and place it in your containers. Budget meal prep is the perfect way to keep your food costs low and your daily food prep time minimal. 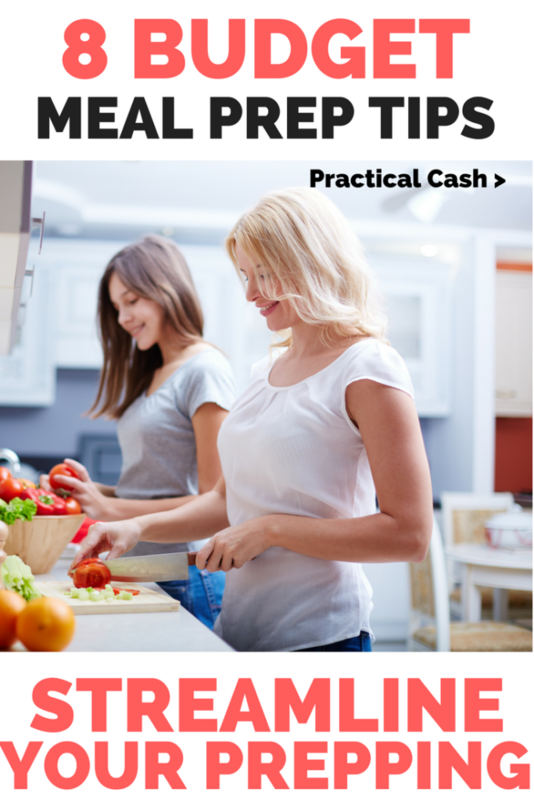 Here are a few meal prep tips I’ve discovered when keeping the food cost budget in mind. Pick your best time to meal prep.Select a consistent time every week to gather your meal prep containers and get cooking. If you have free time and few obligations on Sunday afternoons, for example, designate a couple of hours to cooking. It’s easier to stay consistent with your frugal meal prep or meal prep for weight loss if you build it into your schedule on a weekly basis. Meal plan and grocery shop ahead of time.Before you start pulling out the pots and pans, pull out all the recipes you’ll make in a week and draft your shopping list, including all the ingredients you’ll need, as well as spices, oils, and condiments. It’s frustrating to start cooking only to realize you don’t have what you need. Plan your meal prep recipes around store sales.Log in to your grocery store website to check the sale flyer before you start cooking. Stores advertise loss leaders on meat, fruits, and vegetables, designed to get you in the store because of the amazing deals (and then you’ll spend more on other stuff once you’re there). Choose recipes that use the sale deals – roast beef on sale? Try shredded beef tacos for this week’s prep. Chicken breasts on deep discount? Chicken enchilada casserole might be a frugal meal prep choice for the week. Shop for meal prep containers online or use what you have.You may already have plenty of containers suitable for meal prep storage. You can find some great, frugal meal prep container options online. I like the ones with separated compartments that are suitable for dishwasher use. These meal prep containers make meal preps easier because you just throw them in the dishwasher. You can even reheat the prepped food in the microwave. Choose meal prep ideas using ingredients you already have.Before you make your meal prep for the week, find any ingredients that need to be used up. Choose recipes that use the items you already have to avoid food waste. Meatless can save you money.If you’re vegetarian, you know that specialty vegetarian items at the grocery store easily increase your total grocery budget. But making meatless meals with beans, rice, or healthy grains as a feature can be a way to save and eat less expensive meat. Use Ibotta for savings when you plan your meal prep ideas.You simply buy the items you’d normally purchase and then submit your receipt info. You’ll get money back, making it easy to save on meal prep ingredients and other foods. 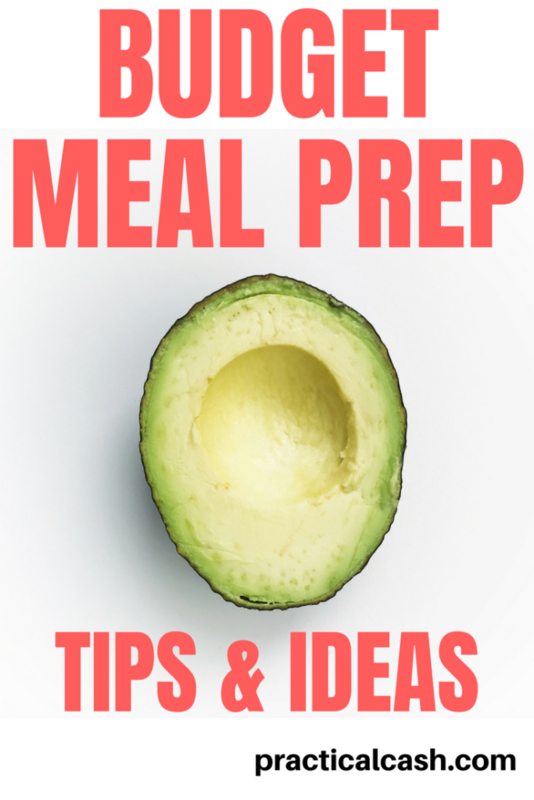 Prep breakfast and lunch ahead too!Don’t stop at dinner – meal prepping for breakfast, lunch, and snacks is also frugal! Easy meal prepping can be an amazing way to lose weight, stay healthy, or just avoid eating out spending! What are your favorite meal prep recipes that you make ahead of time?